LET’S CONSIDER THE OCCUPY – 99%’s TRUMPED UP ANGER….. When compared to other industries we find that the ranking of profit per dollar is as follows: Pharmaceuticals & Medicines, Computers & Peripherals, Beverages & Tobacco, Electric Equipment & Appliances, All other Manufacturing, and then Oil & Gas. Interesting isn’t it? Yet, Obama and his crowd fight with determination to destroy the Oil & Gas Industry and in doing so make the cost of EVERYTHING for the consumer skyrocket. That does not even take into account the locking us into dependence on those countries that want to destroy America for our Oil & Gas. Why would any President or Political Party support that when by the testimony of experts in the field and some of which formerly supported Obama tell us that in ten years we could not only virtually pay down the deficit, balance the budget, reduce the national debt and see the price of gasoline under $2.50 per gallon? Those experts also tell us that we could be free of dependence on oil from countries that are not our friends. We could stop the insane enslavement through debt to China and other countries. But that is not something they want and one has to ask why? I guess it really doesn’t matter why, the fact that they do and their actions scream at us that they are willing to prevent exploration of our own natural resources is enough to tell them “Good Riddance.” It certainly is for me! Let’s look a little deeper at this picture. We hear the screams from the left and the Occupy crowd of how utterly evil the corporate executives are especially in Big Oil, but are they? Let’s look at a breakdown of where their profits go. 2. 20% invested in Mutual Funds. 4. 18% is placed in IRA’s. 5. 7% to Other Institutions. The ownership of America’s oil companies is dispersed among a wide variety of individuals and institutions. Those include Individual IRA accounts, Teacher’s pension funds, as well as “mom & pop” investors. In other words, “middle-class” America is the beneficiary of the success of the Oil and Gas Industry. But who is trying to put them out of business? Barack Obama and the left! In an Obama interview in San Francisco in 2008 the question arose regarding his views and plans for “Coal” and he said: “I will institute a Cap & Trade System that if anyone wants to open a coal plant they can but they will go bankrupt because the punitive levies, fines, and fees that we place on them will prevent them from succeeding.” In his home state of Illinois “Coal Fired Plants” are closing. He only wants America to produce so-called “Green Energy” that is not yet technologically available and the cost is prohibitive. He even declared that if his policies went through the cost of electricity would naturally “skyrocket” and he thought that was a good thing. Really? How do you feel about it? Can I ask one simple question? “If you open a business what is your hope?” Is it not to make a profit, make your life better, achieve your dream, and leave an inheritance to your children as well as possible help others? If in starting a business you succeed and hire thousands of people making it possible for them to earn a living and provide for their families, why is it a bad thing that you get wealthy as a result? Also, why is it the government’s or anyone else’s business or responsibility to come in and demand that you give up your share or tell you what your share of the profits is allowable? Why should they be allowed to take what you have earned as a result of your willingness to “risk” capital and effort to achieve? You could have failed and been bankrupt but you succeeded so why should you not be rewarded and reap the fruit of your labors? I guess I just don’t get it why so many are willing to “hate” those who succeed and want them punished for their success. The truth is that in doing so we reduce the willingness of those who can to “risk”, “invest”, and “produce”, then we have people left with NO JOBS, NO HOMES, NO MONEY thus requiring the Federal Government to issue subsidies making them slaves to the system and dependents of the Federal Government. I know why this is the desire of Obama and the left – VOTES! How many people are going to vote no on money coming to them? If your boss came to you and said, “I’m going to give you a 25% salary increase, would you turn it down?” Why not? That is more than the vast majority get as a raise so why should you benefit when they don’t? You need to take care how you respond so as to remain consistent in your argument and anger at the so-called 1%. 1. Pray as if everything depends on God – – (It truly does). 2. Work as if everything depends on us – – (In a sense it does). 3. Research, Expose, Educate, Inform, and VOTE. America is a goner! What price are you willing to pay to see a Restored America functioning as the Constitutional Republic that our Founding Fathers established? You actions between now and November will answer that question as will your appearance at the polls and your vote. May God bless America and may God bless each of you! 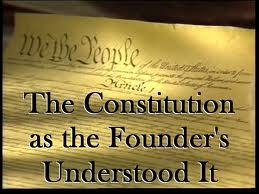 I am completely convinced that Barack Obama and most of the politicians in Washington, D.C. have no clue about economics nor do they understand the Constitutional restrictions on the Federal Government. Maybe they do and just do not want to follow the Constitution or rational thought and do what is right and the best for America and the American people. Creation of a “welfare state” is clearly Barack Obama’s objective through which the populace will become enslaved by the Federal Government. This ideology was something that the founders abhorred and sounded multiple warnings for all then and now to hear. Wow! Mr. Madison you understood, your contemporaries understood, but our present day politicians and current President can’t seem to get their heads around this principle. Wait, maybe they can and what you have warned against is exactly what they want to happen! They clearly do not want “limited government” so instead of giving them the benefit of the doubt I must call into question their motives, plans, objectives, and agenda. If the destruction of America and growing an all-encompassing and all-consuming Central Government is the goal, then the direction you are taking us is the one to accomplish that. However, let it be known that the majority of the American people DO NOT WANT THAT! Mr. Jefferson clearly understood that the insane spending of money that one does not have as our present government is doing or any government does is nothing more than “swindling” the people. It is “theft” on a grand scale and felonious larceny. Acts of Congress may make it legal but morally it is criminal. Yet, the left, progressive, socialist, and professional political elitist have, no other desire than to pursue this with their all. Once more in the following quote we find a keen understanding of what is important regarding government and economics and the Constitutional restraints placed on the Federal Government. Yet we seem to have been so passive that we allowed our liberties stripped from us and are now in a dire crisis. My firm conviction is we know what needs to be done. Therefore, the only question is: “Will We Do It?” November is the turning point for America and the Free World. Our vote in November will determine the fate of America and will have a major impact on the rest of the Free World as we know it. A vote for Obama will be a vote to end America. A vote for the Republican candidate will be a vote to seek the opportunity to see America restored. Again, that candidate may not be perfect or ideal but he or she will be infinitely better than what we now have and will give us the opportunity to take steps to salvage what is left of this beloved Republic. So, I call upon you to REMEMBER NOVEMBER and VOTE! WHY NOT A RESTORED AMERICA? What is it that we need to do to see America restored to her former state of Constitutional greatness? What do we require to bring this nation back into compliance with the guidelines of the Constitution and bring the three branches of government into compliance? What do we require to rid ourselves of the elitist, professional political class who pass laws that do not apply to them and place burdens on the backs of the citizenry that are too heavy to bear? 2. We must determine that we will not allow an elitist, professional political class to exist. That would mean possibly term limits or a concerted effort when we go to the polls to vote out anyone who demonstrates that propensity. Once they have been there a term or two it is time for them to go back to private live and earn a living like the rest of us. 3. We must, now, vote out Barack Obama to give us even the remote possibility of a nation to restore. 4. We must vote out every liberal, progressive, socialist who demonstrates a willingness to further causes such as the United Nations Agenda 21 and Sustainable Development Imitative. 5. We must find, through prayer, research, investigation, questions, and every other means available the most fiscally responsible, national defense conscious, and constitutionally minded individuals we can and back them with our finances, labors, and votes as well as our prayers. 6. We must not become weary in this effort and must remain united and strong willing to pay whatever cost to achieve this goal. If we are willing to do those six things then we will see God move to help us have a restored America and buy us time. For those of us who want to see the lost brought into the kingdom that is important. For all who want to see the individual liberty and freedom that the Constitution and Bill of Rights affords us that is imperative. American hangs in the balance today and it is up to WE THE PEOPLE to rise above the rhetoric and lies perpetrated by the left-wing, progressive, socialist and labor tirelessly educating all who are educatable and present the truth so we can say that we have “sounded the warning.” It is my hope and prayer that you will REMEMBER NOVEMBER and fulfill your right, privilege, and duty and VOTE! God bless you and God bless America!